Part five of a series. The earlier parts are here: part one, part two, part three, part four. 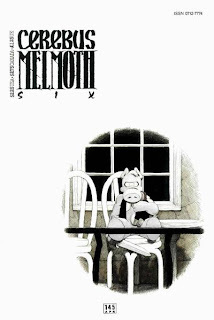 Before moving on to discuss the covers of Melmoth, the story collected in the sixth "phonebook" compilation of the Cerebus comics, I thought I would pause for a moment to discuss a few other covers that aren't part of the ordinary run of 300 issues of Cerebus. 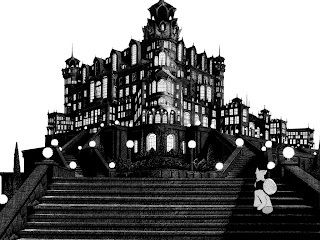 This is one image where the effect is, I believe, mostly Gerhard's -- but it's appropriate to highlight this too since he was, after all, Sim's artistic collaborator for much of the series (although, as it happens, not for the part included in High Society), and his art adds a lot to Cerebus overall. That one makes a pretty fine wallpaper, actually. -- And that brings me back to Melmoth, and the covers for its individual issues. These are simply quiet, beautiful images (click for the larger version to really see); the contrast between the day and the night in the first two is particularly nice, as is Wilde's friend walking him home. The cover of #146 again has someone at the window, but he is looking at something inside the room, and has more of a sense of loss and waiting than of disturbed, voyeuristic watching. Here we have Wilde's sickbed, Wilde's friend writing one of the letters whose text makes up the issue, and an aerial view. I think that the aerial view is particularly well done: it is the death issue, and there is the sense of distance which could be interpreted either as the disorientation of grief, or as a heavenly view, perhaps even of a departing spirit. And again, the color schemes in all three covers are lovely, particularly the light in the cover to #144. Again we are outside the same inn, although this time without the lush backgrounds that are present in most of the storyline's covers, perhaps to indicate Cerebus's detachment from the world, perhaps to distinguish the fantasy of his storyline with the realism of the story of Wilde's death. Seemingly yet another inn exterior, if anything simpler and with less interest than the previous ones... except that, as we look again, we see the blood splattered on the inn's door. 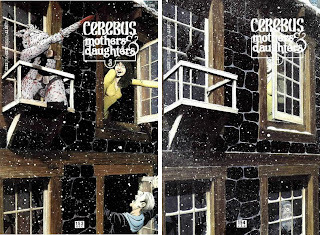 This recreates the effect of the issue itself: starting with Cerebus outside the inn, there is a radical shift in tone, a sudden outbreak of violence, as events suddenly ramp up after two slow, quiet storylines and a bloody confrontation sets up the second half of the overall Cerebus story (or at least I presume it does; I don't know for certain, since this is the last issue I've read!) It's a wonderful off-panel effect, in which the central subject is not shown, in which the tone of the overall image, deceptively similar to the other recent ones, is disrupted by the blood splattered within it. 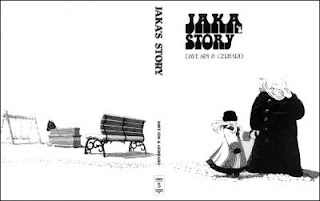 How much stylistic variation there is within any particular storyline's covers itself varies: there was a huge range of styles in the "Church and State" storyline, whereas the covers from Jaka's Story and Melmoth are more tightly integrated, stylistically, within each series. 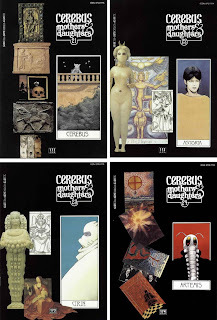 I think it's fair to say that the stylistic unity of the covers for Cerebus's storylines tend to increase over the course of the run, but this is not at all a hard and fast rule: it's a general trend that seems to appear in a scattered field of data, and whether you see a trend with lots of exceptions or a simple chaotic variance probably says more about you than about it. 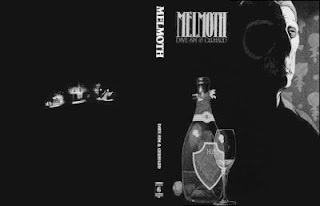 In any event, after the (comparatively) tightly unified style of the Melmoth covers, the next storyline contains considerably more internal variation. 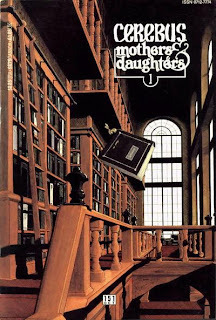 This storyline was labeled "Mothers and Daughters" on the covers of the issues themselves, but it was published in four separate phonebook collections, each with its own title -- sub-storylines, if you will. 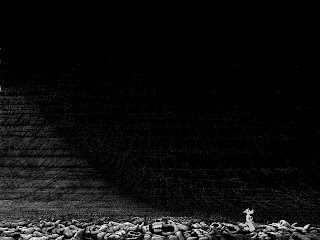 -- Although the context is a bit bleak once you read the story, the actual image is simply gorgeous. 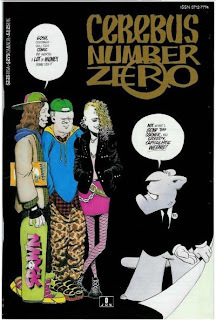 I find the first image quite funny (the people's expressions are incongruous with Cerebus's bloody pose) -- perhaps unintentionally so, since there's nothing very humorous about the scene itself; but the second image is deliberately and appropriately creepy, particularly when paired with its predecessor. In both cases the multiplied Cerebus is shown in a window, with a similar border, and against a black background. In the cover to #155, we have Cerebus in flight (as per the title of the phonebook); this is interrupted by the cover to "Mind Game V" (as happens in the story). And then in issue #157 we have "Mind Game VI" -- as it is indeed so-called -- but Cerebus deliberately refuses it: flies away (continuing, as it were, his journey from #155 -- although far more confident now). We can see the window-image, the 'Mind Game' logo, indeed the Cerebus: Mothers and Daughter logo too, all at the bottom of the image: Cerebus flies away from it, refusing (or trying to) the next Mind Game. On its own it's simply a nice image, but in context, it's genuinely wonderful. Actually these are also examples of covers that (however odd it may sound) each portray a scene that takes place within the comic; but the scenes are portrayed in a common (and striking) style. The face of characters in the issue (in the case of Cerebus, Roach reborn as Swoon, with his 'sister', Snuff) are surrounded by a series of boxes with small images of various mysterious (and presumably symbolic) objects. 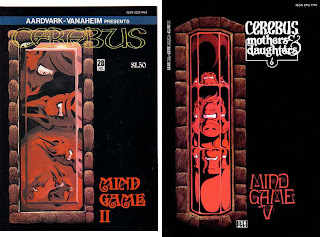 But of course in the case of the cover to Cerebus #165, this is set within a black background, making it similar to the covers from the later issues as well. It's just that the characters of Swoon and Snuff are also portrayed in a way which mimics a McKean Sandman cover. And that brings us up to the next phonebook -- and, again, the limit of what I've read thus far. So I'll stop here for now. 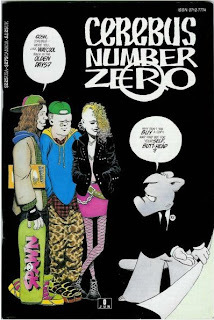 I do plan to do one or two more posts analyzing the rest of the covers in the run, plus a final post with concluding thoughts on Cerebus as a whole -- and getting to reccomendations at last. The next post won't be up immediately -- it may be a couple of days or more -- but (FSM willing) it'll be up eventually. So stay tuned. Further Update: Part Six is now online here. I've also put up an index post with links to the entire series. Good stuff, as always, Stephen. 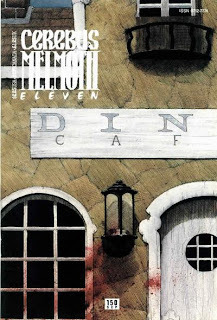 One question: on the Sandman parody cover, there's a photograph on the top of the image border. Is that Dave Sim wearing Neil Gaiman-style sunglasses? And as always, thanks for the positive feedback, Matt. As for the picture: you know, it doesn't look like Sim to me... but I've got a bad eye for faces. I can't really tell who it is. (Anyone out there know & want to jump in?) Be neat if you were right, though. You're close. It's Gerhard. There are several photos of both Dave and Gerhard on the *back* covers over the years, and I've met them both in person. No doubt about it. Interesting series of essays, by the way.